- National team headed by Tom Slingsby features some of Australia’s most decorated sailors and Australia’s most successful Ironman Ky Hurst. - Australia to host first SailGP race in Sydney Harbour, February 2019. - Teams will race identical wingsailed F50s – supercharged catamarans capable of breaking the 50-knot barrier – competing for championship trophy and US$1 million prize. The Australia SailGP Team from L to R: Sam Newton, Jason Waterhouse, Kyle Langford, Tom Slingsby & Ky Hurst. Tom Slingsby – Olympic gold medalist, America’s Cup winner, eight-time world champion and member of the Order of Australia – was today tabbed to lead the Australia SailGP Team in the global racing league’s inaugural season. The full team was unveiled this morning on Sydney Harbour, which last week was announced as the first ever race venue (February 15-16, 2019) for the new racing league. The Australian team features some of the nation’s most decorated sailors, including Olympians, Sydney to Hobart alumni and Australia’s most successful Ironman Ky Hurst. SailGP will give Slingsby and the Australian crew the first chance to represent their country in boats of this caliber. The identical wingsailed F50s are the fastest catamarans in the world, capable of reaching speeds exceeding 50 knots (60mph/100kph). 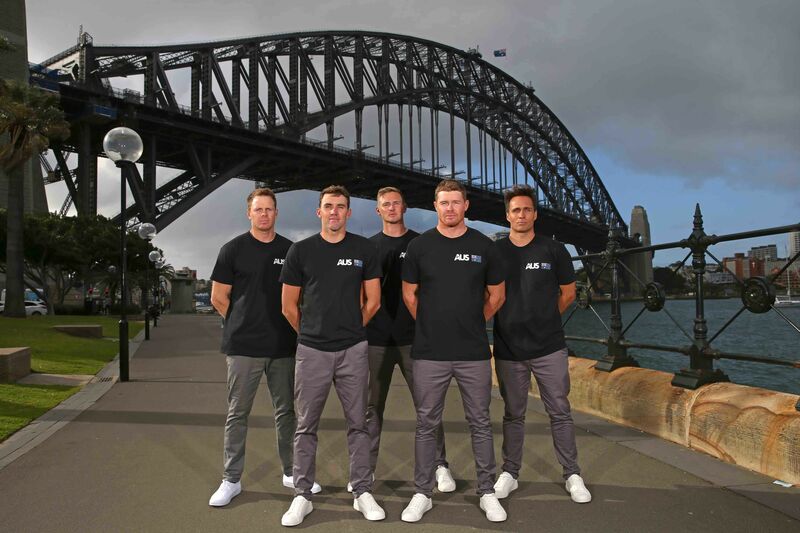 The five members of the Australia SailGP Team are: Slingsby, 34, of Sydney (helmsman); Kyle Langford, 29, of Lake Macquarie, New South Wales (wing trimmer); Jason Waterhouse, 26, of Sydney (flight controller); Hurst, 37, of Gold Coast, Queensland (grinder); and Sam Newton, 32, of Sydney (grinder). In addition, Kinley Fowler, 30, of Perth, Western Australia, will serve as the reserve. Spearheaded by Larry Ellison and Coutts, SailGP has set out to redefine sailing and will bring intensely competitive, inshore racing to fans in Sydney; San Francisco; New York; Cowes, U.K.; and Marseille, France, as world-class crews compete for the championship trophy and a US$1 million prize. Australia will take on teams from China, France, Great Britain, Japan and the United States. FOX SPORTS has signed a three-year agreement as SailGP’s Official Broadcast Partner in Australia, and will air each of the global races on the network, starting with the Sydney event live. SailGP is also working toward a partnership with a free-to-air network for additional coverage of the Sydney grand prix in the Australian market. “FOX SPORTS is delighted to become the official Australian broadcaster of SailGP for the next three years starting with live coverage of the Sydney race in February 2019. We look forward to following the exploits of the Australian SailGP Team led by Tom Slingsby, with FOX SPORTS bringing sailing fans all of the exciting on-water action from every race in the global league as it visits locations such as San Francisco, New York and Marseille.” Peter Campbell, head of FOX SPORTS. With a primary goal of growing global viewership and broadening its fanbase, SailGP and its television partners will focus on personality-driven broadcasts utilizing patented and leading-edge immersive media technologies. The SailGP event in Sydney will take place in Sydney Harbour, east of the Harbour Bridge and Opera House. Shark Island will provide striking spectator viewing, with the event hub at Royal Sydney Yacht Squadron in the city’s north shore. The Friday and Saturday racing will feature vantage points from a variety of locations, both onshore and on the water. The Australia SailGP Team also announced its founding charity partner the Loyal Foundation, which raises money to fund children’s medical equipment for hundreds of hospitals across Australia. Sanctioned by World Sailing, each SailGP grand prix event will consist of two competition days with five fleet races, culminating in a final match race between the two leaders. The final race in Marseille will feature a winner-takes-all, US$1 million championship match race between the season’s top two teams to conclude three days of racing.